The most wonderful style time of the year is here. And just about any outfit can be your holiday go-to with the right combination of layering and statement pieces. For styles that are fire hot when temps are cool as ice, keep reading—we’ve got the inside scoop. Keep reading for tips on exactly what to ask your Stylist for in your upcoming Fix! Ask your Stylist for: Chic holiday clutches and dressy boots. 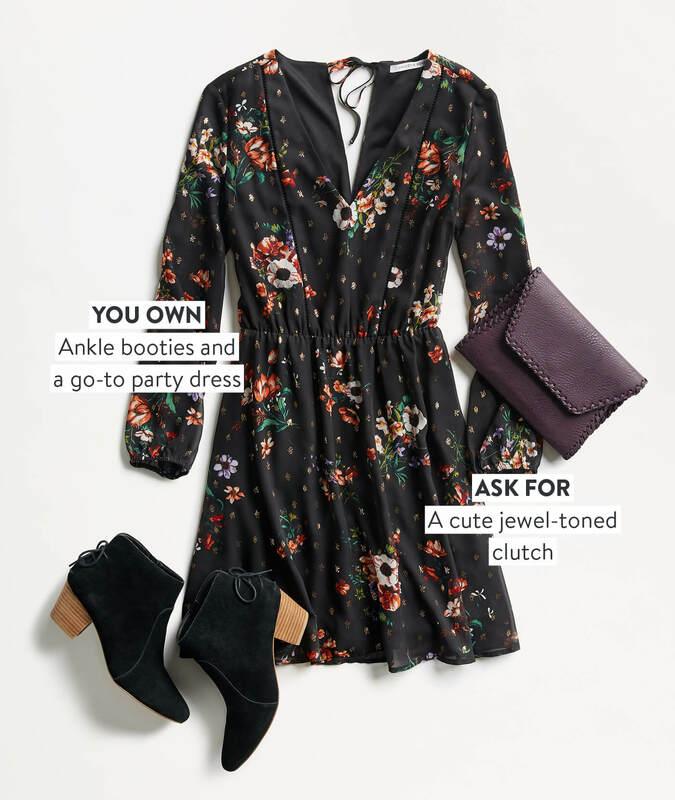 When the weather doesn’t permit showing much skin, an easy fit and flare holiday dress with rich-colored opaque tights and booties is the right move to “winterize” your look. A work shift dress pairs exceptionally well with a silk blouse or a turtleneck for your casual office party. For a timeless look that accentuates your silhouette, add super-sparkly accessories or a vibrant clutch to amplify the wow-factor to your favorite sheath dress for a night on the town. Ask your Stylist for: Bright colors and a touch of sparkle. In a cozy mood? We’ve got layers for that. Pile on your new favorite sweater under a cute puffer vest if you really want to seal in the warmth while on-the-go this holiday season. Layers help to define your style from the inside out. Start light with a cami or thin long sleeves and build your way up with heavier layers as you go—think soft knitted cowl neck meets faux fur outerwear. 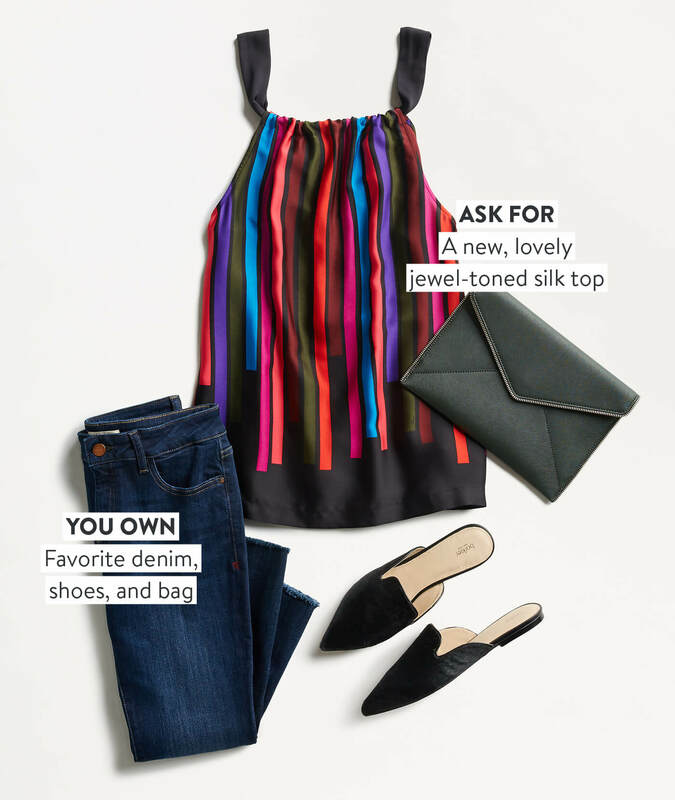 Ask your Stylist for Feminine Tops. A feminine top with a flair for dramatic details like lace, silk and metallic finishes are a top choice for the holidays. Ring in the chic with a bell sleeve top, dark wash jeans and pointy toe booties or flats. Go bold at the office holiday party with luxe-looking, jewel tone tops that emanate confidence and the exuberance of the season. 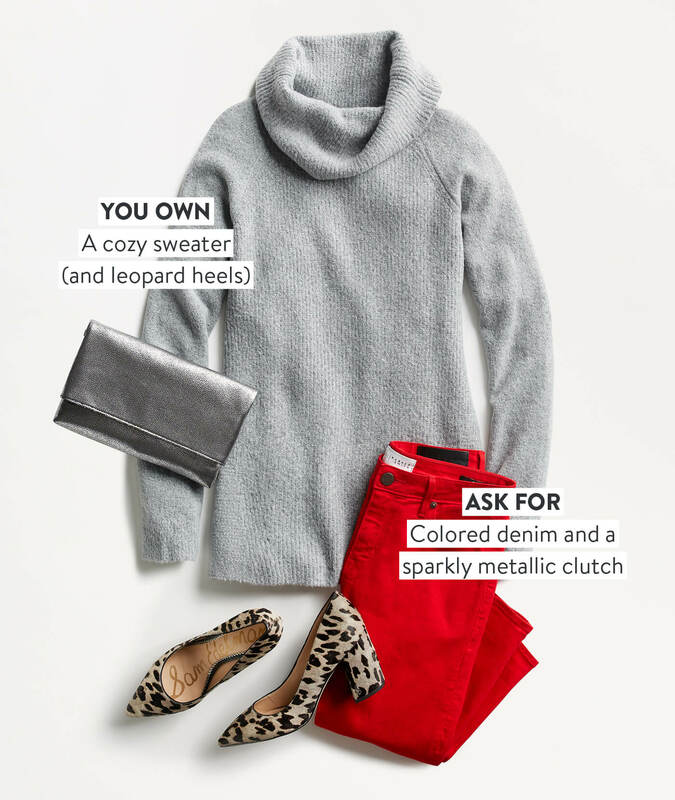 Getting dressed for the holidays is a snap with your Stylist on hand to assist. Ask for a very merry mix of wintery, holiday-ready pieces in your next Fix.